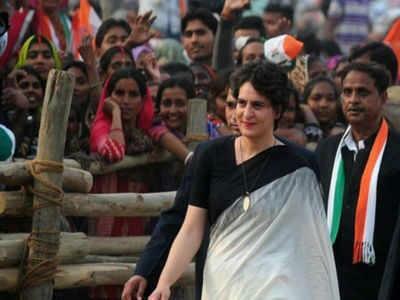 Lucknow, Feb 10: Ms Priyanka Gandhi Vadra, the newly-appointed AICC general secretary of Uttar Pradesh East, who is expected to get a grand welcome in the city of Nawabs on Monday on her maiden arrival to Uttar Pradesh after joining active politics, will be on work immediately after reaching the city. During the roadshow, which will go through the old city area, the Congress leaders would be welcomed at more than 20 places while they will pay tributes to the statues of Mahatma Gandhi, Dr B R Ambedkar, Sardar Ballav Bhai Patel, Indira Gandhi and Rajiv Gandhi. The next day, her day will again begin at 0930hrs. After wrapping up meetings with leaders from Barabanki, Kaiserganj and Bahraich by 1300 and finishing lunch in the next half an hour, Priyanka will again meet party workers from Bansgaon, Deoria, Dumariya Ganj, Kushi Nagar, Sant Kabir Nagar, Maharajganj, Faizabad, Shrawasti, Gonda and Basti till 2330hrs. The roads, from where the roadshow will pass have been decked up with hoardings of the Congress leaders with big photos of Priyanka and Rahul Gandhi. The leaders would be welcomed by the city congress at more than 20 places during the road shows, in which representatives from different communities and groups would be invited. AICC women wing president Sushmita Dev along with her team arrived on Saturday night and will hold a meeting on Sunday to garner massive presence of women in welcoming Ms Priyanka Vadra. UP Congress president Raj Babbar, is also camping in the state capital for the past two days and held meetings with the Lucknow district committee to review the preparation for the welcome of the leaders and the roadshow. The SPG team led by a senior officer also reached Lucknow to coordinate with the state police on the security of Rahul Gandhi and Priyanka during their roadshow. The SPG team has also inspected the Nehru Bhawan, where Priyanka would be holding meetings with the leaders during her four days stay.